I mentioned last week – prior to the fabulous Armchair BEA event – that I have made several online visits to my local library, requesting books like there is no tomorrow. The first group of library books posted had to do with my newfound hobby of photography. Today’s loot, in honor of Weekend Cooking, will focus on an old past-time of mine, cooking. I used to love to cook – before picky eaters and full-time job entered my life. But I am finally at a point where the picky eater fix their own meal (on the rare chance that she is actually home for dinner), and I feel that my teaching life is at a point where I do not have to focus on it constantly. I am hoping to find some new recipes to add to my old collection, so that come fall I can easily plan a week’s worth of meals, cook about 3 nights out of 7, and enjoy leftovers the remaining days. The cookbooks that I focused on this time are Food Network stars that never fail: Rachel Ray (I need to master the 30 minute meal), the Barefoot Contessa, and Paula Dean. I also added a Taste of Home book to the mix as well as a Chinese book by Martin Yan to hopefully help me utilize my new wok. I quickly discovered while skimming these books that I will have to make the recipes on a rather infrequent basis or my waste-line will expand exponentially and all the money I saved by eating in – will soon be spent on a new wardrobe. But…not to fear…I just went online and ordered several “lower fat” cookbooks that should be ready for pick up next week. So….I will obviously not run short of library loot postings over the summer months! Do you have a favorite low-fat summer recipe (or cookbook) that you would like to share? I would love to hear! Better Homes and Gardens – New Dieters Cookbook. I absolutely love it and cook from it all the time. My husband and my 16-year-old son request their favorites, and the recipes don't taste low fat at all. We love the Turkey-Rice Bake, the Chicken Cacciatore, and the Lasagna. Since i am now retired. YEA!! I am going to get back into cooking again. 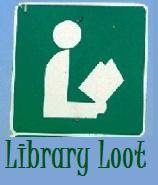 So I am going to be hitting the library, bloggers, and the internet to find some new recipes. Have a great day! Perfecting various recipes over the summer sounds like a fun project. Isn't it nice to have the time? As to suggestions for food books – I seem to be finding my newest recipes in cozy mysteries. lol It's not so bad to combine two loves. I can suggest a website of all authors who write mysteries filled with recipes: Mystery Lover's Kitchen. as annoying as I find Rachel Ray…and I do…her recipes actually often look very good. I have a couple of Rachel Ray's cook books and always have good results with her recipes – love those 30 minute meals! Weight Watchers has some really good low fat/low cal dishes. I own one of their cookbooks, but many recipes are available online. I adore the Barefoot Contessa's books. I still have a couple to buy. I tend to go mostly vegetarian in the summer — so many fruits and vegetables at the farmers market, we end up eating meat only a couple of times a week. I love cookbooks and might have to add a few of those to my library. Hurray, a lot of books to go through and find nice new recipes. I never thought of getting cookbooks at the library. I'll have to now. I must pick up a Rachael Ray book. The online recipes I've tried have been very good. I add rotisserie chicken to it and a batch will easily make at least 3 meals in a two-person household. My favorite 30-minute meal cookbook is "The Best 30-Minute Recipe."